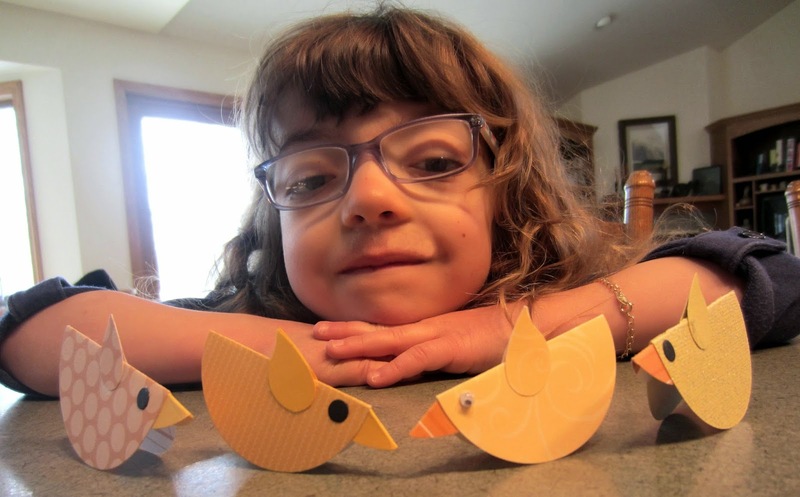 Last week, I discovered a darling Easter craft -- little paper chicks -- that I thought would be perfect for my granddaughter, Stella, and me to do when she came for a visit the coming weekend. Stella, being six years old, and quite the little artist herself, I was excited to take on this cute project with her. The original instructions called for all the chicks' eyes to be black dots. However, Stella and I decided to experiment a little bit, and try googly eyes. I don't know. While the googlies are cute, I still like the blatant black dots the best. What do you think? Here is one of the chicks up close and personal. Don't you simply LOVE all the detail?? Just kidding. These are so simple to make, with no real detail whatsoever. While the original post boasted wings created from petals from "fake" flowers bought at the craft store, I decided to simplify and "cheepen" (ha!) 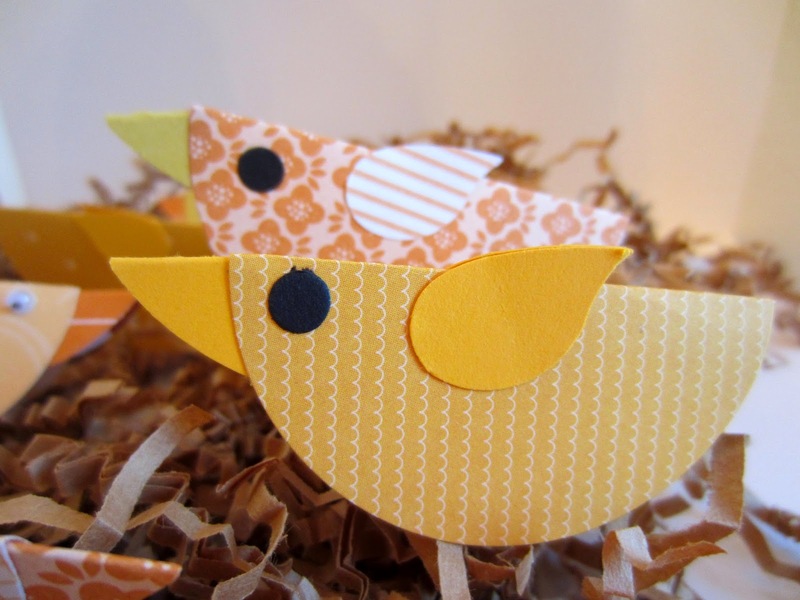 my chicks by making my wings from cardstock or DSP, mostly in complementary colors/prints. My chicks are two different sized circles: 2 3/4" and 2 3/8". I used the Circles Collection Framelits (page 186 of the big catalog) for my bodies. 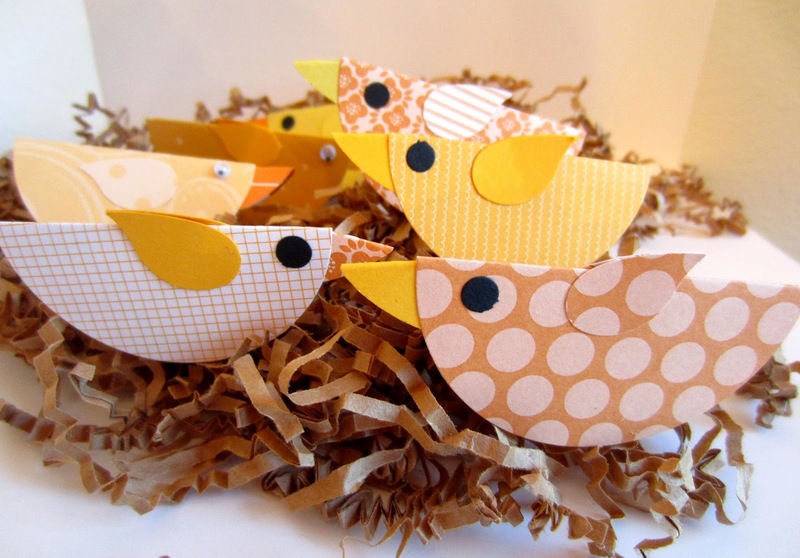 Using these Framelits, you could make a whole flock of chicks in multiple sizes. Imagine!! My wings are actually the wings from the Bird Builder Punch (page 183 of the big catalog). Clever, huh? I know: I always work outside the box. But I like my chicks' beaks the best. They are made from a punched heart folded in half. I send my thanks to Noreen Doll from Crafty Journal for her darling idea. If you would like to see her original chicks, chick them, er um, check them out here. 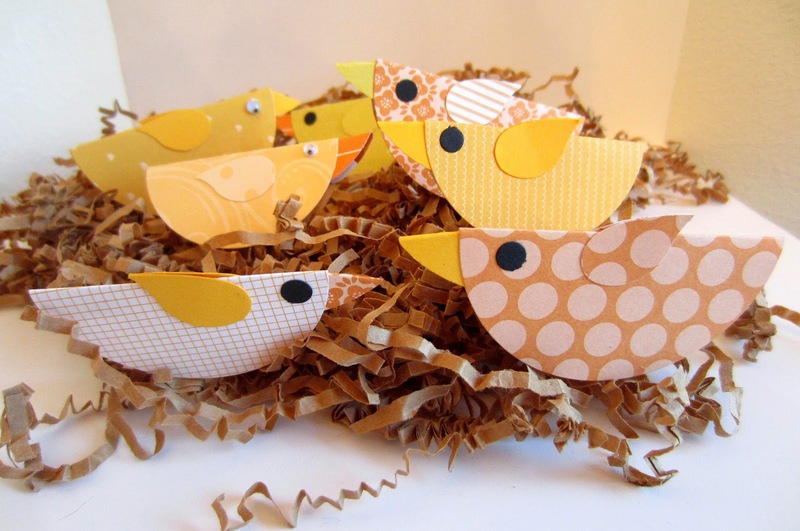 And this is my Pinterest post of Noreen's little cuties to my Papercrafting board. These are so cute. I like both eyes, bet the candy dots would be good eyes too, or maybe the eyes from the owl builder punch. I can imagine you and Stella had fun making them. Such a fun idea! These would be great for a spring party with my kindergarteners. They could make them easily but then stay entertained by playing with them for a few minutes while I set up the next activity. Hey Girl! It’s Deonna from the Child at Heart blog. I was just stopping by to say hello! 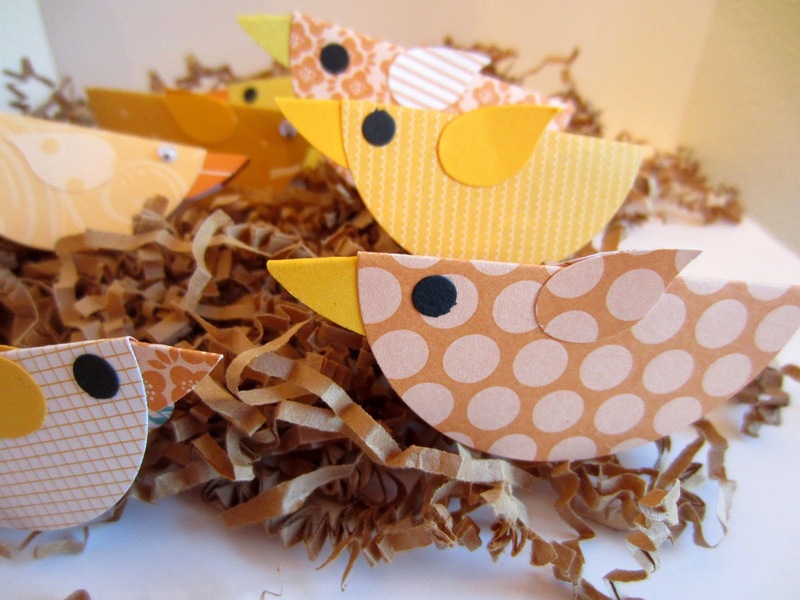 I love paper crafts and these are SO cute! I am doing a great spring necklace giveaway and would love for you to come by and enter to win :) Have a joyful week! These are adorable, Linda! Thanks so much for sharing at the par-tay. Have a lovely weekend. Wow, I love this idea with the chiken. I will try to do something similar. Looks very funny. Happy Easter! Cute! Pinned for next year. Fun! I can't wait until my granddaughter is old enough to do crafts with. So totally cute!! I'm visiting from Turn It Up Tuesday. This is so cute and creative! Thanks for sharing! Hi Linda, Thanks for the mention of my Rockin' Peeps. I like how you made the little nests for them. Simple project for little hands! Love it! Thank you so much for sharing your creativity with us at Show-Licious Craft & Recipe Party! Join us again on Saturday morning at 8:00 am EST!